The Cerrone Show is a top ranked business podcast specifically for entrepreneurs and anyone looking to make a change in their life. The Chris Cerrone Show is an audio podcast hosted by Chris Cerrone and Laci Urcioli. Wanting to bring some new names to the podcasting world they have interviewed some fantastic entrepreneurs, solopreneurs and awesome people. Guests that are the movers and shakers in their industry like Chris Brogan, Cynthia Sanchez, Amy Schmittauer, Greg Hickman, Sue B Zimmerman, Rosie Tran, Bryan Lanning, and Renae Christine just to name a few all talking about internet marketing, small business, comedy, sports, fitness, mobile, coaching, seo, blogging, social media and even Youtube! Through a very conversational style interview with a focus about entrepreneurship they not only learn about each guest personally but also some great tips, tricks, and how to steps that people can use immediately in their own journey. How Chris ended up creating a podcast show? What makes podcasting generally interesting? 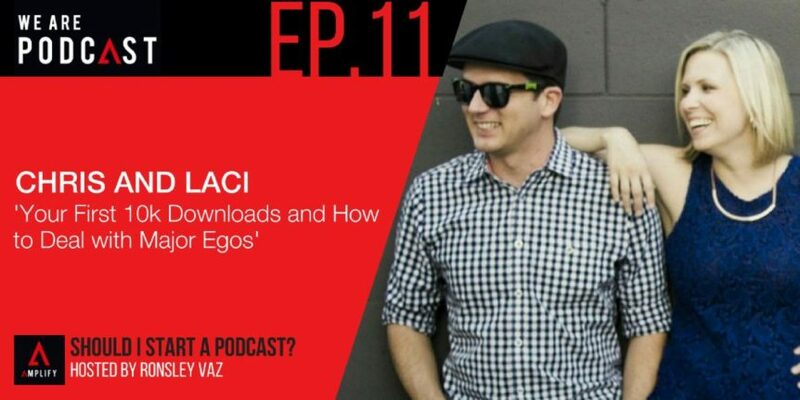 What are Chris and Laci have managed to achieve from a business point of view out of podcasting? What’s like having a co-hosts? You really don’t know until you try it. There’s nothing wrong in trying. What’s coming up for The Cerrone show? You really don’t until you try. I’ve seen shows start and I think to myself and I even tell Laci like what the hell are they doing. But then those shows become ridiculously popular. They have an amazing audience. I’ve seen the opposite. You really don’t know until you try it. At the end of the day for the host or hosts of a show, If you’re fulfilled and then you’re having a good time, like freaking do it why not? It’s your platform. Grab that experience. For people who are thinking “Does my business applied to a podcast”? Just because you sell insurance or whatever boring crap you may do, no offense. Imagine if you’re an insurance sales man start doing a tutorial or tips or a Q and A type show like what if you told stories about the craziest insurance fraud stuffs you’ve seen or just like stories about like made it actually entertaining and sponsor the show with your company. Yeah and I think you’re a business thinking about utilizing podcasting for your business or whatever, I think it’s important to think about who you’re trying to reach and who the heck is out there. Are there people out there would you as a consumer be interested in listening to episodes and shows about whatever the product is. An insurance person asked me if they should start a podcast recently and I said “Oh My God please don’t, please don’t do an insurance show.” And then I stop myself and I said wait a minute, you should do an insurance show because people especially in the states are so scared to just go speak somebody in an insurance world because they’re afraid they’re going get sold and upsold and swindled. This would be a perfect opportunity for you to just pull back the balance. You’re teaching people something they can’t learn elsewhere or it’s hard for them to learn elsewhere. So if you’re a product or you’re this or you’re that, is better explained by listening or showing somebody on your video or audio then freaking try it and do it. There’s nothing wrong in trying. The time it takes to actually create, produce, market a show properly because for us this is what we do. This is what we’ve been doing for a while now. Just the time it takes to do it properly. It’s literally like an entertainment, being a movie director. We have this ups and downs, we are hot and you’re not. Most people don’t care who you are. If you’re in podcasting, that place into the success of your show. If you want to do a good show, I you want to make something out of it, if you want to actually help people or where your audience like, you’re going to be paying attention. You can’t turn off. If you don’t care if you got listeners, you don’t care if you got money out of it, those disadvantages won’t affect you that much. But For people like us. It’s tough to turn off it really is. It’s tough to you know, you’re afraid you’re going to miss something that you could see there is content, that you connect, someone that you could connect, someone that you could help and things like that. I think another disadvantage too is how easy it is to get stuck into a room of everybody that saying the same thing and doing the same thing you are and how hard it is to diversify who you spend time with when you’re involved in something is schools of podcast. For a while like they’re only the people we said anything, got involved with, had an interaction with on a day to day basis for like to two to three months people with podcast, people that were in online business or our family. The reality is there’s so much more life out there. So you have to be more careful to balance that when you’re involve in such a heavy heading online world. Just make sure you have diversity in your life because that diversity will come through in your conversation in the show. So many people starting podcast now and the first question they ask is “How do you make money?”, “How do you make money?” Respect the platform first. Fall in love with it. Because if you’re going try to make money on this thing, you need to love it passionately because it’s a labor of love. The un-intangible return is so evident. It bumps me out when people overlook it because they’re other focus on is money. I think the important thing to know is like for people who are starting a podcast, like reviews are great, feedbacks great but at the end of the day this is your show and if you’re doing it to help people and you want to hear what people need help on and that’s the feedback you want to listen to but try not to sink too deep and to doing what other people want because Chris and I actually went through that. We started, made changes, we’ve done a lot of great things. The expert telling Chris don’t make that change, don’t change from three times a week to one time a week, and don’t add a co-hosts. All these things. You’re going to mess up your brand, these and that. You really going to pick and choose who you want to listen to but don’t sink too deep into that. You really follow your gut. It’s your show. And if your audience is on that journey with you, they will take a left turn with you when you tell them to take the left turn. And if you lose some people and they weren’t really your audience to begin with. Take months off to start fresh and start with new perspective in order to be able to make a plan so that our audience is getting authentically 100 percent with us all the time. It’s far more dynamic if you’re not a person who’s meant to be on a mic in your own which I don’t think I am. I don’t think I could be. I’m very much a conversationalist as well, then you need to be bring a new dynamic into the show or try it and “How do you find out? You just try.” You go and talk to people in Starbucks, you talk to people in your life, and you find people that you are interesting and have them on your show.